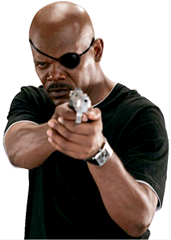 Sam Jackson may be Nick Fury, So Back Off! Samuel L Jackson has confirmed that he will playing Nick Fury in the upcoming Iron Man film... kinda, sorta, well, after a fashion, kinda, sorta, well after a fashion. But he refused to say whether he had shot any scenes, and adamantly refused to formally confirm that he will be playing the head of S.H.I.E.L.D. In fact, he seemed to get quite angry with the interviewer. That just doesn't seem like a wise thing to do. He is Sam Jackson after all. I look forward to maybe, or maybe not seeing him in the upcoming film.